Announcing the 2014 Park Ranger of the Year Award! Nominate your favorite Park Ranger for the 2014 Park Ranger of the Year! ServiceWear Apparel announces the 2014 Park Ranger of the Year Award, created to honor a park ranger who goes above and beyond in service to his or her state park and community. Nominations can be submitted now through August 29, 2014 at www.servicewearapparel.com/ranger. The winning park ranger will receive a $1,000 grand prize and $1,000 worth of uniforms for his or her state park. The nominator with the winning submission will also receive a free Red Kap® Soft Shell Jacket. ServiceWear Apparel will select a group of finalists based on criteria outlined in the contest guidelines. Then online voting will open from September 8 to September 19. The winner will be announced September 30. For more information on the 2014 Park Ranger of the Year Award, visit www.servicewearapparel.com/ranger/ or contact info@servicewearapparel.com. Tru-Spec has partnered with POLICE magazine and is giving away over $1,000 in Tru-Spec products to one lucky law enforcement officer. Entries are being accepted through April 30, 2013. Only sworn law enforcement officers who are residents in the U.S. and U.S. territories are eligible. Go to www.PoliceMag.com/TRU-SPEC now to get the full details and enter! Tru-Spec uniforms, and the new 24-7 Series® line of apparel, is a direct result of listening to the consumer and delivering quality apparel that is versatile, rugged and comfortable, while still having all the features to get the job done. In a recent survey of more than 500 active police officers, respondents were asked to compare several major brands of tactical pants. Tru-Spec 24-7 Series pants were the overwhelming favorite in virtually all categories. To learn more about outfitting your department in Tru-Spec, complete our online form. Fabric selection is one of the most important factors when choosing a uniform for your law enforcement or police department. The fabric affects everything from comfort and mobility to durability and performance. An uncomfortable or ill-fitting uniform can distract the officer and inhibit performance, and an insubstantial uniform can be unsafe and more costly to replace over time. Below are several items to consider when selecting a fabric for your law enforcement or police uniforms. Consider the duties that will be performed in the uniform and external factors such as the climate of your region. Fabric should be sturdy enough to provide adequate protection and durability, but lightweight enough to be comfortable and easy to wear. The fabric of a uniform may determine if uniforms can be washed at home, or if they will require dry cleaning. A soil release treatment will allow dirt and stains to be removed more easily during laundering. Consider the color retention of the fabric, to see how it will stand up against frequent washing. Wrinkle resistant fabric, or a “durable press,” enhances appearance with less effort, as it requires little or no pressing or ironing. A water-repellent finish causes liquids to bead up and roll off, keeping officers looking professional at all times. Wickable fabric draws perspiration away from skin and spreads it over the fabric face where it quickly evaporates, so officers stay cool, dry and comfortable. Breathable fabric allows cool air to move toward the body, while warm air passes away from the body. Police and law enforcement uniforms must meet high standards for quality and functionality, while projecting an image of professionalism. Consider all aspects of a fabric to ensure your uniforms are comfortable and durable. 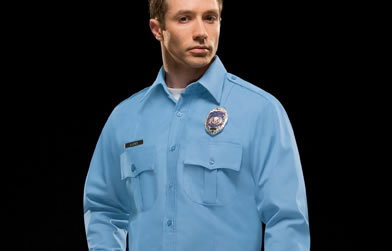 Our Account Management Team can help you select the right fabric for your law enforcement uniforms. Click here to get started and learn more. ServiceWear Apparel offers a broad range of uniforms from top brands. Click here to see what we offer for police and law enforcement departments.